Combining a matching game with a visual building aspect is a hit in this game called Robot Face Race. Players are on the hunt for the right head based on what the robot randomizer says. Kids will have a lot of fun racing to find the match and building their robots. Children's game are fun to play with your child or perfect for encouraging controlled playtime with a friend or sibling. Educational on a lot of different levels and something fun for them to do. Learn how to play below and let us know how you've like playing Robot Face Race. The first player to collect five robot scoring tokens by finding five correct robot faces is the winner! A game board, 20 robot scoring tokens, robot randomizer and the official Robot Face Race game rules and instructions come with this game. Please keep in mind that the official Robot Face Race childrens rules and instructions could be different depending on the game version you have. 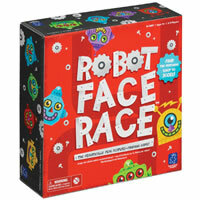 The rules below are some of the exact directions on how to play Robot Face Race. Share with us your comments, funny stories, tips, advice, strategies, creative ways to play, questions about how to play, problems with the rules or anything you want about Robot Face Race. All submissions will be reviewed within 24 hours. Click here to add your Robot Face Race comments.